This Amish desk chair has been nicknamed the Throne Chair since it surpasses all expectations of comfort and quality! This hardwood desk chair is deal for desk work, typing, meetings and conferences. This is an office chair unlike one you've ever experienced! Individually handcrafted and made in America, the Clark Executive Desk Chair is quality and beauty that you can't find in an "Office Max". We've all experienced an office chair that either breaks or stops functioning after mere months. In fact, you may even be sitting on one right now. Our Amish craftsmen hold every piece of furniture to the absolute highest standards of craftsmanship. All of our Amish office furniture is designed and constructed to last a lifetime! 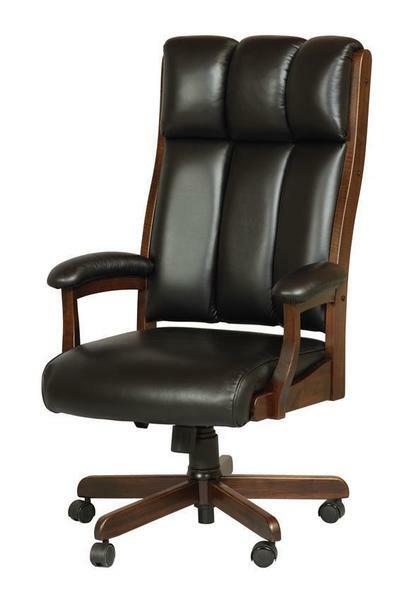 Additionally, the Clark Executive Desk Chair is built to exact customer specifications. Choose the wood species, finish, and fabric or leather that best fits your home and style. Feel free to call us toll free and speak with a friendly and knowledgeable furniture specialist today at 1-866-272-6773. 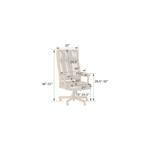 Overall Height: Adjusts from 46 1/2"-52"
Seat Height: Adjusts from 19"-24"
This is the chair for my home office - I can sit on it for 10 hours and feeling rested and relaxed. Great material! The best gift you can do to yourself if you work from home!